Description: WADE heading west from Wigginville in Lowell, MA. Description: NMJ-to E. Deerfield idling at Waterville Yard. 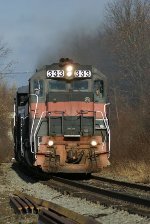 Description: The NMED led by triple 3 idles on track 1 while the SAPPI-4 with 314 heads north to Hinckley and Skowhegan. Description: Triple 3 leads NMED as it throttles up to head for Rigby and E. Deerfield. Description: Light power heads west. 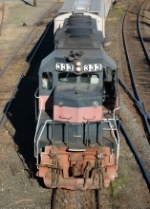 Description: Light power heads west at Wachusett Curve. Description: AD-1 sits in the rain at North Adams. Description: PONM with MEC 612 - B&M 333 - MEC 345 backs to their train after making a pickup. 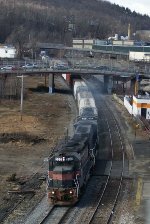 Description: Pan Am train POED heads west through Shirley along the old Fitchburg. Description: Rests at Pan Am's Rigby Yard. Description: Roster shot of B&M 333. Description: MEC 614 leads AYED through Shirley. Description: MEC 614 leads AYED into the Garnder yard to pick up more freight cars before continuing on to East Deerfield. Description: MEC 614 leads AYED into the Gardner yard. Description: Ready to back in west side of OX.